People have submitted themselves to some pretty crazy living situations in the name of saving money. You may have heard, for example, about the Google employee who lived in a truck in the compound parking lot to mitigate San Francisco’s sky-high rent. Or Heidemarie Schwermer, who’s been living without money at all for 17 years. She moves from place to place, trading her services for room and board. Many of us have our own tales of couch surfing with generous friends, even if only for a few hard days or in our travels. But I still don’t think I’ve heard a story quite as strange as that of Matthew Haines. At 19, Haines managed to save up $14,000 in just nine months… by sleeping behind his friends’ couch. Yeah, we wanted the details, too. Here’s what we learned. Five years ago, Haines was an army private based in Manhattan, Kansas. After living in the oldest barracks building on the base for three months, he decided he wanted a change. But his small salary of about $1,500 a month meant he didn’t have much to spare for his off-campus living arrangements. So Haines made friends with some local college students and convinced them to let him move in. There was just one problem: All the bedrooms were already taken. However, they did have a couch available — or at least a patch of dark space behind it. Since his new roommates were college students, “they were always up late doing stuff for school,” Haines explained. Since the WiFi was best in the living room, the couch was prime real estate for studying. So they pulled it away from the wall, draped a blanket over the top and made Haines the smallest man-cave in history. It wasn’t the comfiest place he’d ever slept, but his hard days of training helped him get used to it quickly. “You have a couple of sleepless nights and then you get so tired you don’t care,” he said. According to Haines, sleeping wasn’t even the hardest part of the arrangement. That honor went to figuring out where to keep everything besides his body. But despite his small quarters, he certainly couldn’t beat the price of rent: He paid just $100 per month, and his share of the utilities. Split five ways, that never came to more than $50 per month. This story’s sounding less and less insane as we go, am I right? Thanks to his new digs’ minimalism, Haines was able to save more than $11,000 during his nine-month stint behind the couch. How’d he save so much of what he made? By spending as little money as possible to cover his basic needs. On top of the $150 he spent on his living space and keeping the electricity on, Haines’ only expenses were his $40 cell phone plan and groceries. He ate a bare-bones but healthy diet of eggs, chicken breast, oats and broccoli. He didn’t have a car, so when he needed to go somewhere, he’d hitch a ride and pitch in for gas. He also supplemented his income by selling plasma, earning him an extra $200 per month. Since he was making $1,700 per month and only spending $450, he was able to sock away that extra $1,250. After nine months, he’d amassed $11,250. He used $6,000 of it to buy a used car, avoiding depreciation, and invested the rest into his Roth IRA, where the magic of compound interest helped him earn and save even more. First of all, we’re not necessarily recommending Haines’ strategy, although it makes a fantastic story. He assures me he wasn’t technically squatting, as the group cleared the arrangement with their apartment complex. Haines underwent a background check and signed a sublet agreement to make sure everything was kosher. But other folks who’ve taken on creative housing arrangements in the name of frugality have faced legal problems. That said, Haines’ story has lots of other takeaways you can implement, without fear of recourse, right now. And you probably should: Haines’ commitment to extreme frugality has helped him get a great head start on the path to financial independence. Today, he owns two businesses, makes $80,000 after taxes, and will have paid off the house he shares with his wife in the next five years. He estimates he’s saving a full 50% of his current income. Did I mention he’s only 24? Clearly, Haines was able to retain the important lessons he learned behind the couch and implement them over the course of the five years that have elapsed since then. If you ask him about the most important thing to know about controlling your money, his answer will be familiar, but relevant as ever: It all comes down to making a budget. When you have a budget, says Haines, “you know exactly what’s going on, where [your money’s] going, and why it’s going there.” Unless you know how you’re allocating your funds, it’ll be impossible to figure out what expenses you can cut to save cash. Plus, a budget can “open your eyes,” as Haines says, to your bad habits: You might be shocked to find how much money you waste on tobacco, alcohol or video games. Once you have a budget in place, you can begin to make a plan for how to save the money you need to achieve your financial goals. Whether you’re intent on buying a home, traveling the world or leaving work with a hefty retirement fund, you can’t achieve them unless you save up the cash. Even if amazing opportunities present themselves to you, “if you don’t save, you won’t have the money to take advantage of [them],” Haines says. His story also highlights the fact creativity helps you save money — and especially helps you find unusual ways to earn more of it. Haines has continued to sell plasma as often as he can, and has banked almost $8,000 on that practice alone. He says it takes him about 45 minutes twice a week, so it’s easy and helpful to others. Looking for your own ways to become a money-saving rock star? You’re in the right place. Although it’s hard to imagine saving $1,000 when you’re stuck in the paycheck-to-paycheck cycle, we have a step-by-step guide right here. We’ve also got awesome ways to save money on groceries, one of the most negotiable line-items on your budget (psst — don’t have one yet? Get yourself situated with these 7 steps). Follow enough of our advice, and hopefully, you’ll never have to sleep on anything weirder than a futon. Some things are just worth the money. 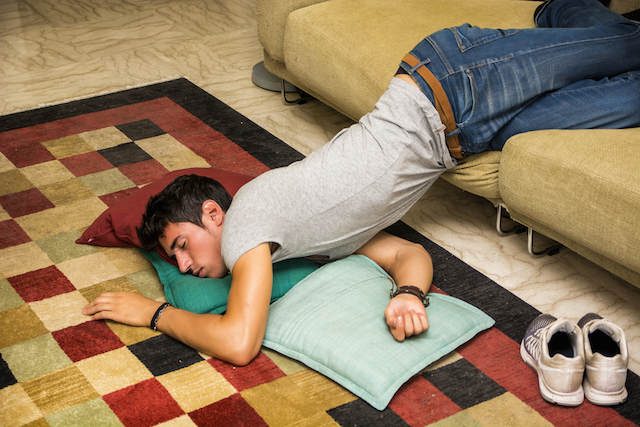 Your turn: Would you sleep behind a couch for nine months to save money? Jamie Cattanach (@jamiecattanach) is a staff writer at The Penny Hoarder who probably wouldn’t give up her bed unless a lot more than $11,000 was at stake. Her creative writing has been featured in DMQ Review, Sweet: A Literary Confection and elsewhere.